Pioneers in the industry, we offer heavy duty continuous band sealers and automatic continuous band sealers from India. In order to meet the rising demands of the clients and the industries, we are producing Heavy Duty Continuous Band Sealers. 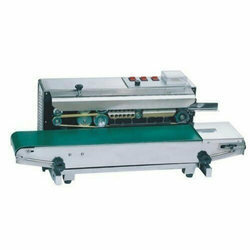 Designed to be used for long period of time, these band sealers could seal the bags which are made using the thick films. The offered range of these sealers is available in the technically effective range and is renowned for their superlative performance for long time. Finally, these heavy duty continuous band sealers are available at economical prices to the clients. We are an eminent organization in the field of offering Automatic Continuous Band Sealers to the clientele. 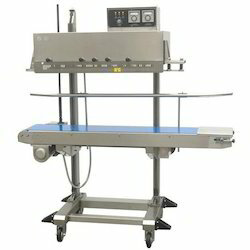 Mostly, these band sealers are used for packing the small bags and to do so, these utilize the electronic constant temperature control system. The best quality sealers are available with our organization and these are tested for their quality by our quality controllers on certain well defined parameters. Looking for Band Sealers ?